A colleague once described the customs around home-building in first century Palestine. In those days, houses grew as the family grew. When a young man reached the age to marry, he was given building materials to add onto the family dwelling. Many rooms would be connected around a central courtyard, where meals were cooked and families gathered. This is how the extended family would stay connected, living together, sharing life and work, while each generation had its own set of rooms that were connected to the rest of the family house. Nowadays, with land at a premium in Palestine, families still build onto each other’s homes, but it’s vertical. Families build up instead of out. They simply add another story to the parent’s foundation, and the adult children raise their own families above the grandparents. 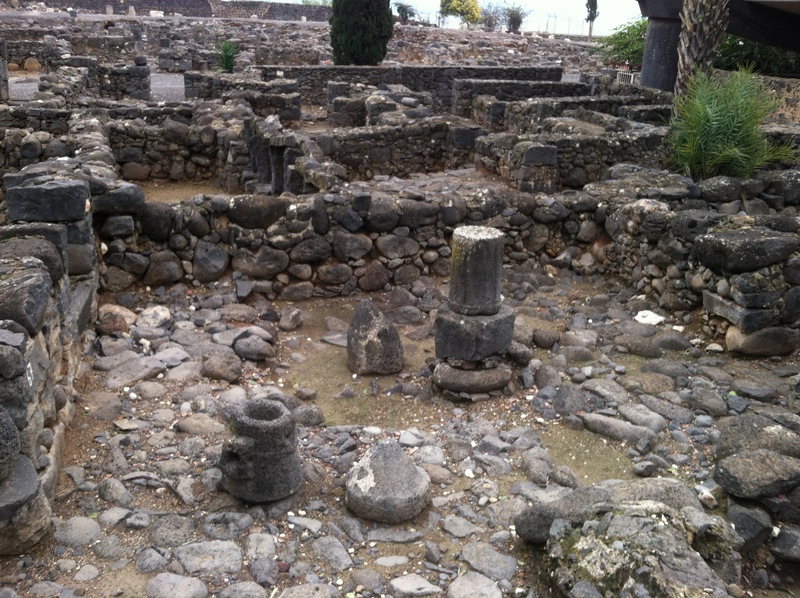 Even though Capernaum was only a small fishing village, it had an impressive synagogue, where Jews could worship and learn scripture. This is the view of the synagogue from Peter’s house. 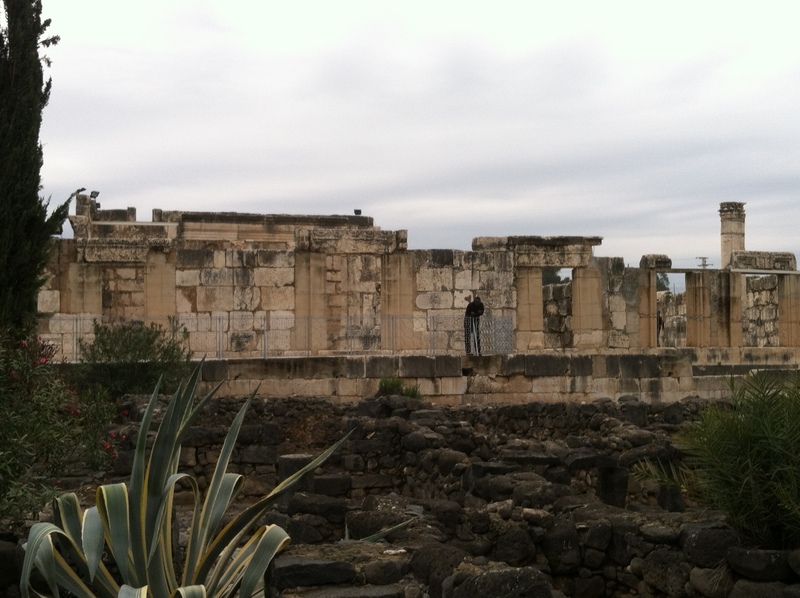 It’s only a few family dwellings away from the home where Jesus probably stayed while he was in Capernaum. Archeologists think that these synagogue ruins date to the second century, but this “new” synagogue was built on the same stones as the old one. Much of the pavement and the lower three feet or so of the wall come from the first century, when Jesus would have been there. 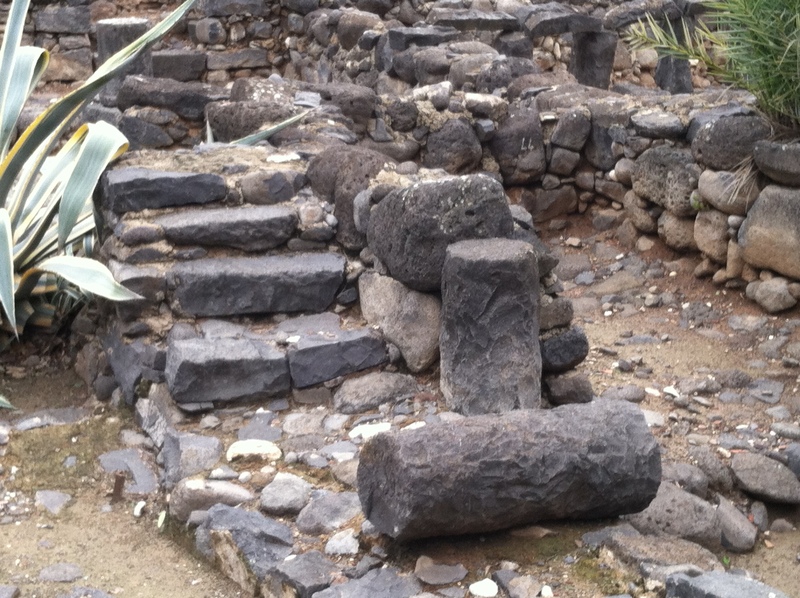 The floor plan would have been about the same – a central court, separated from the side corridors by columns, and long stone benches lining those outer corridors – this was a style of synagogue particular to Galilee, and other synagogues excavated in nearby villages are arranged in this same way. The columns would have supported an upper gallery for the women. They would have reached this gallery by an outside stairway. 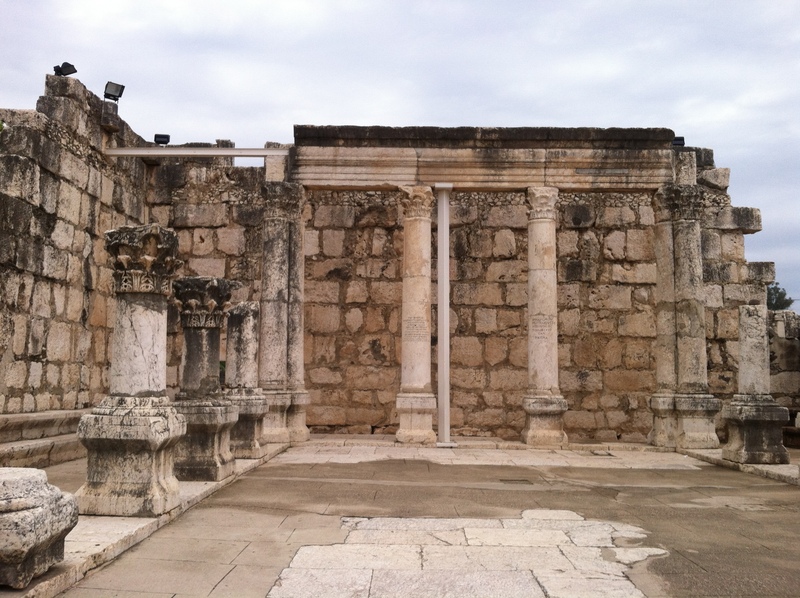 This is where Jesus would have taught on that Sabbath, when he went to the synagogue “as was his custom.” As you look at this picture, imagine Jesus seated between the two tall pillars at the back wall. The men who are gathered to hear him are nearly out of view, seated behind those thick columns, under the gallery. Mark doesn’t tell us how Jesus came to be teaching in the synagogue that day. Maybe the local rabbis invited him after Peter introduced Jesus as his houseguest. Maybe they had already heard something about this new teacher from people who had heard him in Nazareth, or tasted the wine at Cana. However it happened, Jesus has pricked up the ears of his listeners. This is not some dry explanation of scripture they’ve heard before. This man teaches scripture with power. It’s as if he wrote it himself! Then suddenly, a man steps into the center court of the synagogue and starts shouting at Jesus. There are two things remarkable about this encounter. First, that a person with an “unclean” spirit managed to get into the synagogue at all, and second, that it is this “unclean” spirit who identifies Jesus as the Holy One of God, right here at the beginning of Mark’s story. Jesus has only called four disciples at this point. He has ventured 40 miles from his hometown of Nazareth to begin his ministry in this little fishing village. But this unclean spirit already knows who he is. Jesus begins his ministry in Mark by picking a fight with a demon. What does Mark mean by an “unclean spirit?” If we focus on the “unclean” description, it’s possible the man was simply suffering from some illness that made him “unclean.” There were lots of temporary physical ailments that could have accounted for this description. But this man had an unclean spirit, which means he probably suffered from some mental or emotional burden. We might associate this term with demon possession, and if that was the case here, it must have been pretty well disguised. The man who suffered from this particular unclean spirit had apparently been someone from the community, someone everyone knew, someone who was accepted as “okay” to enter the synagogue. He looked normal. He acted appropriately, at least in public. On the surface, he seemed just fine. But in his spirit, there was trouble. Have you ever held a secret agony in your heart, knowing that you were not right with God? Maybe it was just a little sin, something you did or avoided doing that no one else knew about but you. You were convinced that, if you confessed your sin, others would think less of you, so you went along pretending that everything was okay. You still came to church, you still did all the things that others expected a fine upstanding person like yourself to do, and as long as no one challenged you, you could keep up the charade. But deep down, that sin was eating at you, making you feel dirty inside. And the longer you kept up the appearance of being a good and righteous person, the harder it was to face the reality of your separation from God, a separation that was growing wider every day. You had an unclean spirit. This unclean spirit was the first voice in Mark’s gospel to declare that Jesus was the Messiah, but it knew more than just who Jesus really was. It knew that it was not alone, that there were other unclean spirits hanging around in the shadows that day, too. Spirits of deceitfulness, envy, laziness, sexual sinfulness, drunkenness, anger, pride – spirits that plague us still. “Why us, Jesus? Why are you picking on us?” we might ask. We don’t like being made uncomfortable. Go bother someone who looks and acts like a sinner. Don’t bother us. We don’t want to have to change. We aren’t ready to give up our dirty little secrets. We have all kinds of arguments and justifications for staying just the way we are. And Jesus sees right through us. “Be quiet,” he says. Letting go of our unclean spirits can be a gut-wrenching process. We might even have to cry out with a loud voice before we can be free of the things that torment us. But we have it on good authority that, “if we confess our sins, Christ is faithful and just to forgive us our sins, and to cleanse us from all unrighteousness” (1 John 1:9). It’s that “authority” we need to pay attention to. It was the thing those good fishermen of Capernaum noticed first, and it was the authority in Jesus’ teaching that brought the man with the unclean spirit to his feet. The scribes taught the scriptures so people would become familiar with them, and there is value in knowing scripture for its own sake. But Jesus taught people how those sacred texts could change their lives. The scribes taught to inform. Jesus came to transform. The people of Capernaum were amazed at Christ’s teaching, not because he was eloquent, not because he used the latest buzzwords, and not because he told them what they wanted to hear. They were amazed because he spoke with authority. The power of God was evident in what he said, and how he said it. We might get caught up in the story of the man with the unclean spirit, but his role is really a minor one in this episode. Once he has announced who Jesus really is, the spirit that has troubled him is silenced and sent away. It is the unclean spirit’s response to Jesus that matters here. The spirit was stirred up by Christ’s authoritative teaching, declared the truth of Christ’s identity as the Holy One of God, and then obeyed without question when commanded to leave the man it had been tormenting. We could learn a thing or two from this unclean spirit. Imagine how our lives might be changed if we would allow ourselves to be stirred up by the words of Jesus, if we would boldly tell everyone we know that he is the Holy One of God! Imagine how our lives might be changed, if we were to live in obedience to Christ’s authority, instead of depending on our own wills, our own ways of doing things. But there is a difference between the witness of an unclean spirit and the witness Christ calls us to bear. On Friday, I attended the funeral for a man who had died behind our house the week before. As I visited with members of his family, it became clear that this man had been troubled by unclean spirits of his own. His whole life had been a battle, his father told me. He fought the unclean spirits of alcohol dependence and drug addiction. The unclean spirit of despair tormented him. We now know that the evidence we saw of a struggle in our driveway was not because two people had been in a fight. It was the struggle of one man who became disoriented, who could not find his way out of the corner he’d worked himself into. It was a man fighting with himself, and with the unclean spirit that took away his last shred of hope. Yet, he professed faith in Jesus Christ. He believed that Jesus had died to save him, and he had claimed that salvation promise for himself. So how did he end up as a news headline? I think the answer lies in the distinction those fishermen in Capernaum found between their scribes and the authority they heard in Jesus’ voice. There is a difference between knowing about Jesus and knowing him. There is a difference between being informed by scripture and being transformed by the Living Word of God. THe man who died in my driveway may have been a believer, but he never let go of the unclean spirits that tormented him, or trusted Christ’s authority to make him into a new creation. He never let Christ transform him. As we approach this Table, you have an opportunity to rid yourself of any unclean spirits that trouble you. You have an opportunity to claim Christ’s authority over your life, and to be transformed into his likeness. It might not happen as “immediately” as things seemed to happen in the gospel of Mark, but if you are willing, you can be changed into an ever more perfect reflection of the image of God. Let us pray. O Lord, we come before you knowing that there are things in our pasts we’d just as soon nobody ever knew about us. But you know, dear Lord. Free us from the unclean spirits that trouble us, and teach us to recognize your authority, so we can obey you will undivided hearts, and be transformed more and more into your likeness. We pray these things in the name of the Father and the Son and th Holy Spirit, one God now and forever. Amen.